We have long discussed the regulations regarding inflatables safety in various states across the country. More and more lawmakers are looking into regulating the industry to make inflatables as safe as they are fun. There are a number of reasons for this – however, the primary push for these measures is for overall safety of the people using inflatable bounce houses and obstacle courses at parties. When you look at some of the recent news involving inflatables, it’s easy to see why this regulation might not be a bad idea. 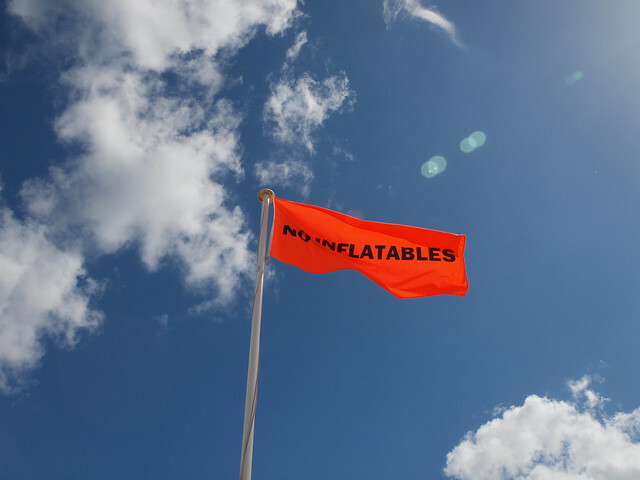 Before you rent or buy an inflatable, make sure you are working with a licensed inflatables company that has the proper permits your area requires. Furthermore, be aware of the safety measures being taken by the company you choose to work with. This story in Kansas is the perfect example of what can go wrong. Despite a number of innovations in physics and technology, the basic design of bridges has remained relatively static, with very few changes. Of course we know that bridges currently being developed are stronger and more aesthetically pleasing than those that came before them, yet the basic essence of a bridge has not been altered radically at all. That is, until now. According to an article from Designboom, a new installation in Paris, France, has taken the basic bridge and flipped it on its head. Whether or not a bridge like this will ever be designed is unclear – however, it’s safe to say we’d rather bounce across the river instead of walking! The practice of using inflatables to draw attention to a business or tradeshow booth is a tried and true method of marketing. Customized and branded inflatables are eye-catching representations of a business logo or mascot – they can bring a lot of foot traffic and visual appeal to a brick-and-mortar or temporary storefront. However, one business in the Medina Township area of Ohio is facing pushback from town authorities and some citizens. Currently lawmakers in Medina Township are working on a proposal to continue this practice or make inflatables allowable, but with restrictions. No word on a final decision has been released yet. Each luminarium only takes 20 minutes to inflate.